Revenue in the Connected Hardware segment amounts to US$6,290m in 2019. Revenue is expected to show an annual growth rate (CAGR 2019-2023) of 4.2%, resulting in a market volume of US$7,419m by 2023. The Connected Hardware penetration is 0.09 in 2019 and is expected to hit 0.10 by 2023. The market's largest segment is Infotainment and Communication Systems with a market volume of US$4,400m in 2019. In global comparison, most revenue is generated in United States (US$6,290m in 2019). The Connected Hardware segment includes products and devices that enable networking of vehicles. A distinction is made between Basic Telematics and Infotainment and Communication Systems. Basic Telematics are aimed at sending and receiving a limited amount of data e. g. for geolocalization or remote access to the vehicle. Either an embedded (eSim) or external SIM-card is required, for example via tethering the driver’s smartphone. Infotainment and Communication Systems include hardware for extended use of connected services. Infotainment Systems serve as an interface between car and driver. In addition to displays, they usually include high-performance computers which are necessary e.g. for navigating or the integration of apps and virtual assistants. Communication Systems facilitate and improve mobile phone integration e.g. via accessing to the car antenna or Wi-Fi hotspots. OBD2 adapters, surf sticks, as well as retrofittable radios or entertainment systems that allow a telematics connection are not part of "Connected Hardware". Reading Support Revenue in the Connected Hardware segment amounts to US$6,290m in 2019. Reading Support The Connected Hardware segment is expected to show a revenue growth of 5.3% in 2020. The “Revenue” box shows the forecast revenue development of the selected market (market segment, region) for each year. Newly registered Connected Cars p.a. Reading Support In the Connected Hardware segment, the number of newly registered Connected Cars is expected to amount to 13.0m by 2023. The “Newly registered Connected Cars p.a.” box shows the number of new Connected Cars of the selected market (market segment, region) in millions for each year. 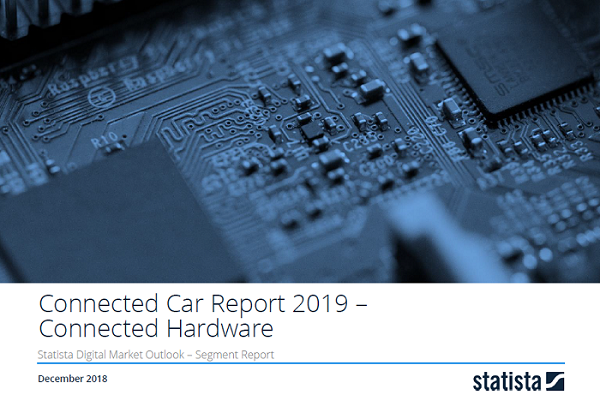 Reading Support The average revenue per new Connected Car in the Connected Hardware amounts to US$162.34 in 2019. The box shows the average annual revenue per new Connected Car of the selected market (market segment, region) for each year. Reading Support With a market volume of US$6,290m in 2019, most revenue is generated in United States. Here you can find more studies and statistics about "Connected Hardware".